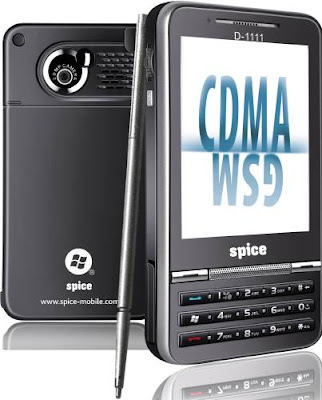 Spice announced the launch of Spice D-1111, India’s 1st Dual Mode ( GSM + CDMA ) windows mobile. Spice’s latest offer supports live GSM and CDMA connections simultaneously and comes preloaded with host of VAS applications including from Nimbuzz, Reuters, Mitr, Opera Mini. Mr. Kunal Ahooja, CEO, Spice Mobiles said, “Spice Mobiles has always endeavoured to drive innovation in the mobile handset industry and set new benchmarks through user-friendly and smart product offerings. With the launch of Spice D-1111, we have introduced world-class dual-SIM (GSM+CDMA) Windows Mobile in India. This unique gadget caters to working professionals who work hard and believe in having fun. Spice D-1111 is based on the Windows Mobile 6.0 platform and is a contemporary, smart and revolutionary gadget that promises exceptional quality and usability. Fuelling further fun and excitement is Spice D-1111’s 2 Mega pixel camera, stereo Bluetooth and expandable memory up to 2GB so one can capture and cherish life actively. Users can also check their mails by a single touch via the push mail feature and enjoy the convenience of checking their mails on the go with Outlook on Spice D-1111. The touch panel is an added advantage which makes this gadget a lot easier and cool to operate. The mobile handset is priced at Rs 18,499/- and is based on the Windows Mobile 6.0 platform.